Ross Perot Jr.’s Hillwood Communities is teaming up with Dallas-based real estate development firm Wynne/Jackson to develop a 350-home residential community in Celina. The two firms in partnership purchased 119 acres west of Preston Road in the Collin County community. The property was acquired from the pioneer Glendenning Family. Hillwood and Wynne/Jackson plan to break ground in September on a community called Glen Crossing for homes prices between $350,000 and $425,000. 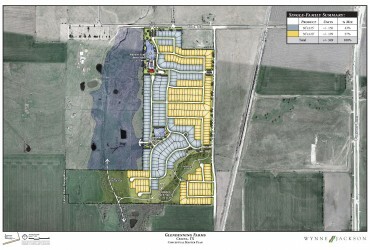 Horizon Homes and Perry Home will build in the Celina project. “Wynne/Jackson has been a top residential lot developer in the D-FW market for years, and their expertise in this product type coupled with their ability to position the property in a manner that greatly reduced our market and entitlement risk proved to be the deciding factor in our participation in this opportunity,” Fred Balda, president of Hillwood Communities, said in a statement. Wynne/Jackson began looking for opportunities in the Celina market two years ago. This is Hillwood’s first partnership with the firm. “The opportunity to partner with Hillwood brings together our experience with their expertise and we believe that will produce a superior community for Celina and for our future residents,” said CEO Clyde Jackson. Wynne/Jackson has been in business for 35 years and developed more than $1 billion in projects, including residential communities for more than 10,000 homes. Hillwood Communities division has developed 24,000 single-family lots in 80 master planned communities. The project with Wynne/Jackson is the latest in a series of developments Hillwood is doing in Celina. During the last 10 months Hillwood Communities has acquired two other development sites in the town totaling almost 650 acres.